Celtic may be in the market for a new central defender after losing Bobo Balde to a broken leg on Boxing Day. The Guinea international was carried off in the first half during the 2-2 draw with Dundee United. Gary Caldwell and Mark Wilson are currently sidelined with injuries, leaving manager Gordon Strachan short of defensive cover. Strachan has had talks with Steven Pressley but Charlton also hope to sign the former Hearts skipper. Scotland international Pressley, 33, is a free agent, after he was released from his Tynecastle contract on 9 December. 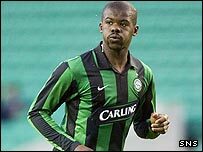 The Celtic website says that Balde, who moved to Glasgow from Toulouse in 2001, will be missing for "a number of months". The 31-year-old appeared to over-stretch while clearing the ball outside his own penalty area, with his right leg buckling underneath him. Balde was replaced by Darren O'Dea, whose 78th minute goal sparked a Celtic comeback from 2-0 down. But the Irishman is just 19 years-old and has only made two starts for the club.